Phylogeographers have long known about the limitations of single locus studies (ie, the effects of selective sweeps, stochasticity in lineage sorting among loci) and that adding loci improves the accuracy of demographic parameter estimates. As we continue to shift towards collecting multi-locus datasets thanks to high throughput sequencing, some interesting questions have come up. For example, what is the best ratio of genetic loci to individuals sampled? What is the role of mitochondrial (mtDNA) and chloroplast (cpDNA) loci in the next gen era? And most broadly, how has the field of phylogeography itself evolved in the last 20 years since the advent of high throughput sequencing? The final dataset analyzed by Garrick et al. contained 508 single-species datasets drawn from 370 papers. 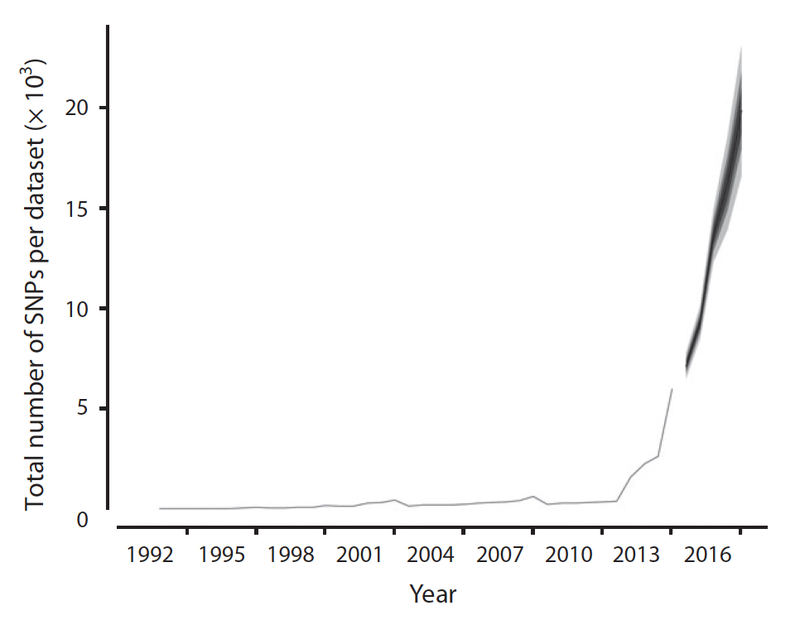 An increase in the size of phylogeographic datasets was found across most major taxonomic groups (see figure above) in terms of the number of loci and the number of alleles sampled, suggesting researchers are putting more effort into collecting genomic and geographic samples. Using exploratory forecast modeling, Garrick et al. predicted that the number of SNPs per data set is likely to reach ~20,000 by the end of 2016 (95% CI 16,590 – 23,133) which represents more than a doubling over the preceding 3 year period (see figure below). …in the era of next-generation sequencing, the perceived distinction between landscape genetics and phylogeography (e.g. Wang 2010) increasingly represents a false dichotomy, as the resulting large DNA sequence data sets should be informative over a broad temporal spectrum. Indeed, the timescales on which inferences can be made are likely to depend more on geographic sampling of individuals than on choices relating to genetic data (Robinson et al. 2014a). 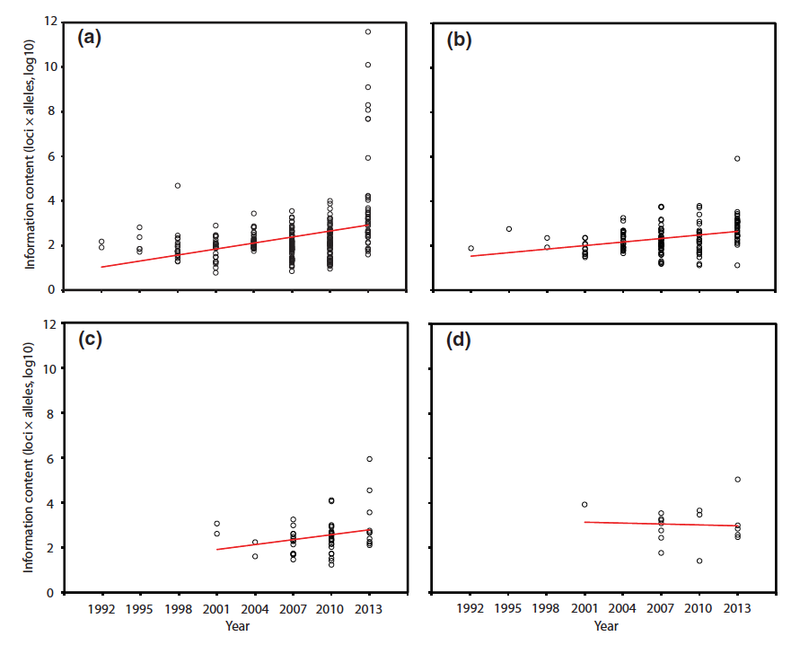 Another interesting finding of Garrick et al.’s analyses is that the number of individuals sampled has increased along with the increase in the number of loci being collected. Is this because we are obsessed with the idea that more data are always better? Or because the savings we accumulate as the cost of sequencing goes down are being spent adding more individuals to the experimental design? I wrote a few weeks ago that adding replicates trumps increasing sequencing depth in testing for differential gene expression but what is the optimum ratio of loci to individuals sampled now that phylogeographic studies are on pace to collect 20,000 SNPs per dataset? It feels a bit like blasphemy to write this but perhaps we can afford to scale back the number of individuals we sample per population and instead devote our time and money to collecting from additional geographic locations or to other projects entirely. Now that Garrick et al. have summarized how far the field has come in the last 20 years, I am excited to see where phylogeography goes next. This entry was posted in evolution, genomics, Molecular Ecology, the journal, next generation sequencing, phylogeography, Uncategorized. Bookmark the permalink.